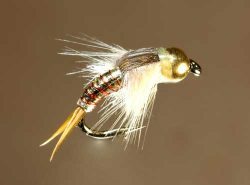 This bright little nymph came onto the scene after seemingly endless variations in its design to make it look and behave as it should— to survive a beating, ride plausibly on a drift, hold the trout it attracts, attract the trout it must hold. When the refining process was nearly complete, I looked at my golden nymph, tapering up the long, straight shank of its hook from the points of its biot tails to the gleaming flare of its metal bead, and thought how it resembled a horn. Just the sort of horn the archangel Gabriel might sound to herald the end of the world. And there it was: Gabriel's Trumpet—a title elegant enough for my elegant new fly. A title that captured the spirit and form of my construct. After the name had gotten around just enough to become established, I found that I preferred the pattern on a humped shank. Now it doesn't really look like a golden horn anymore, at least not one I'd ascribe to Gabriel, unless Gabriel's a big fan of jazz-man Dizzy Gillespi and decided that if the great Diz blew on a bent horn, he should to. A fly's name is small potatoes, something you tag on after the real work's done. The development of a fly—that's the real work. The development of the Gabriel's Trumpet was slow. It involved a whole lot of fishing (oh, no! ), drifting many versions along river beds to see what produced, what didn't. what held together through the stress of a day's fishing, and what didn't. This process is easier with "attractor" patterns (flies that imitate nothing in particular), than with imitative patterns...and harder. You don't have to limit yourself to what looks and behaves like a stonefly nymph or caddis pupa, but you're also adrift with no model. You just keep trying things until the fly seems right to you—whatever that means with such a fly—and then see if the fish go for it. You keep trying different ideas, sometimes wild ideas, and keep coming up with things either you or the fish dislike. Or perhaps you both like it, but it's a nymph that doesn't want to sink, or a dry fly that lands upside down half the time, or it just won't hold a fish. Or you get everything else right and it falls apart after two strikes. It's a strange process, developing an attractor pattern, and I'll always wonder what Doug Prince was thinking when he added those great white spikes along the back of his enduringly popular Prince Nymph. This fly, as it stands today, passes all my tests. I've caught trout on it all over the Western US and Western Canada. On Montana's Bitterroot River, fishing with guide David Dedmon, I absolutely slayed cutthroat after cutthroat ("slayed" in the sense of quick hook-ups and careful releases)—some big ones, too—on a Gabriel's Trumpet in pink. And it's been a killer ("killer" in the sense...you know) many times since. The original fly, in gold, is my old reliable by now. I've had some banner days with it in plenty of rivers across the West. The Gabriel's Trumpet in black I know least. I've caught fish on it, rainbows, browns, but reach past it most of the time for my trusty pink and gold versions. The black Gabriel's Trumpet, however, is clearly the most imitative of the three, and is likely taken for mayfly and small stonefly nymphs all the time. The Gabriel's Trumpet in gold isn't so far from the nymph of the Yellow Sally stonefly or a young golden stone. What Makes This Bright Little Fly So Deadly? The tails are distinct, with a slow taper that makes them seem like real insect tails. The abdomen is bright, to catch a trout's eye, and ribbed for convincing segmentation. The shaggy ostrich herl of the thorax waves in the current, suggesting life. The hackle-legs sprawl convincingly and flex in those currents so strong that they overwhelm the soft thorax. The large head arches towards the bottom in the pose of a dislodged nymph seeking the safety of the rocks below, the head-tuck some stonefly nymphs assume when adrift. It's a bright fly, one that seems alive and struggling. All that aside, it just works. I developed the Gabriel's Trumpet series for rivers. But last spring I tried both the pink and gold below a strike indicator—lake chironomid-style fishing— in some rich Canadian lakes. Both flies produced steady strikes from strong two- and three-pound rainbows. Some days, a number of patterns didn't work at all when the Gabriel's Trumpets were among the few patterns that did. "This was late July," he wrote, and the fishing "is fairly slow around that time, but not when I put on the Trumpet—it made all the difference in the world!" He then asked for the pattern so he could tie up a heap of them for the next season. So, the Gabriel's Trumpet is apparently a lake fly, too. I generally fish this fly deep in rivers, in just the kind of water you'd fish with any nymph. I drift the fly below a strike indicator. They have large bead-heads and a bit of lead at their core—they sink well without help. But if you fish heavy water in rivers like Oregon's Deschutes River, as I do, you'll need some extra lead up the leader to get your fly down. Of course, that goes for about any nymph pattern. Should be a dandy as a dropper with a big weighted nymph on the point, or dangling from a big, buoyant dry fly (such as a grasshopper imitation) with the so-called hopper-dropper system. But I haven't adequately tested it with such rigs, so I can't say. I encourage you to help me with the testing. You can bet I'll be testing these flies on the hopper-dropper system over the next couple of seasons. But for now, I know without doubt that this bright fly below a strike indicator, deep in a river or lake, is deadly. For step-by-step instruction on how to tie this effective little fly, go to Gabriel's Trumpet, Part 2, Tying Steps.